FREE Shipping on all orders to the contiguous 48 states! Like our boots, our flexible service and fast shipping are designed to bring you more than you’d ever expect. Now enjoy free shipping on all orders to the contiguous 48 states. 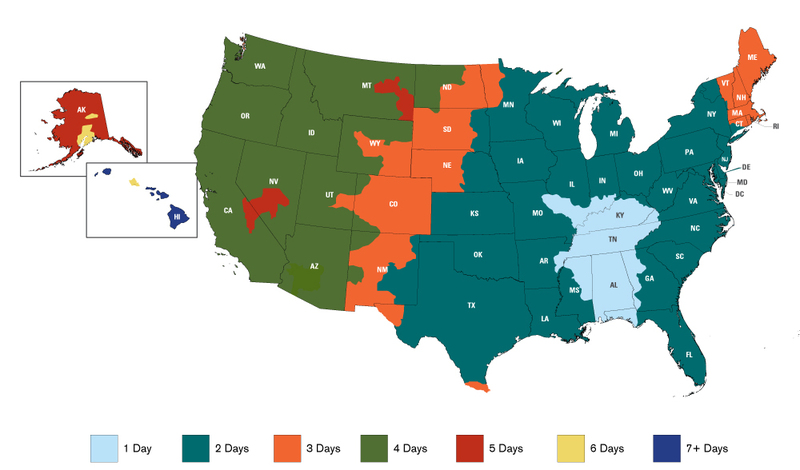 Offer valid for our standard FedEx SmartPost service within the contiguous United States. Upgraded shipping is available for an additional fee. Applies to bpboot.com orders only. RLF International, LLC (a subsidiary of Propper International Sales Inc.) ships according to the table rates listed below. Please note orders cannot be picked up from the distribution center. Please see transit times below for FedEx Ground delivery. Note that Saturday delivery is NOT available and that transit times are in business days (Monday to Friday). RLF International, LLC, (a subsidiary of Propper International Sales Inc.) is not responsible for delays that are beyond our control (such as inclement weather or FedEx errors). RLF International, LLC, (a subsidiary of Propper International Sales Inc.) does not currently ship anywhere outside of the United States. Refusal to accept the order will result in either a partial or no refund as RLF International, LLC (a subsidiary of Propper International Sales Inc.) will have to pay for shipping and fees back to its warehouse.